So clearly I ran out of steam when it came to Fishtrap live-blogging. It wasn’t for a lack of things to write about; instead, there was a lot to pack into the day so that by 10 pm when I got home, I’d had enough and just wanted to vege out. But it was a different type of intensity from going to a weekend science fiction convention. At the cons, I’m usually rushing to meet people, rushing to do panels/signing/reading, rushing to catch something in the dealer’s room before it goes away. No rush at Fishtrap, not really. All of us weeklong participants had morning three-hour workshops to attend. Then the afternoon panel or presentation, followed by open mic readings, followed by faculty readings after dinner. With a couple of exceptions, everyone went to the workshops, while not everyone went to the panels/presentations/readings (or at least every one). That meant the pace was slower to begin with. The other big difference was that this was a forum to discuss craft, not business. There was only one editor from one press present; the rest of us were equally all writers. Now business did start creeping into discussions later on in the week, but for the most part we were focused on craft. It was about us being writers, not selling our writing. Then most workshops had some sort of daily writing work. I think my workshop–the Uncanny, with Marjorie Sandor–had the most writing involved, but everyone was working on some sort of writing assignment throughout the week. My workshop had three evening writing assignments (as well as reading assignments), as well as several in-class assignments. None of the writing work was finished product but I definitely left with either starts or ideas for something like six or seven short stories or essays, as well as ideas for worldbuilding and structure for Netwalking Space. Most of all, it was about words, and writing, and thinking about writing. Robert Michael Pyle has been a favored nature writer of mine for Wintergreen and The Dark Divide, but after this past week talking to Bob and listening to his keynote speech and listening to his prose and poems, I think he’s now my favorite living nature writer. We shared a thrill over pretty book covers (he liked the Beyond Honor cover), and talked a wee bit about the Klone’s Folly story I’m still developing. I didn’t know about Marjorie Sandor before this Fishtrap, but by golly I’m definitely a fan now. She is one of the best critique leaders I’ve worked with and her insights into the uncanny helped me pinpoint some developments in Netwalking Space. Plus she has written the best damn and uncanny second person present tense story EVER. Joe Wilkins turned me onto short prose poems, and Justin Hocking made me think about the power of lists in my writing. There were many more faculty members who shared lots of gems. In any case, I took detailed notes during our workshops because Marjorie came up with observational gems including looking at expanding stories in the unplumbed gaps within scenes–instead of writing more and longer, she talked about going into various hot spots of the pieces we wrote and expanding those sections within what we’ve already written to make it longer. Lots of good stuff. I’ve gone back through those notes already with a highlighter, to help me identify key points. But even though the flow is a different pacing from that of a three or four day con, there were still some similarities, just more subdued. Con glaze didn’t hit until day five of seven. And imposter syndrome set in about day four. However, unlike at a convention, while I was sitting in a swing between two trees looking up at the steep slope of one end of Chief Joseph Mountain and thinking imposter syndrome thoughts, a woman who had heard me read here in Enterprise back in December came up to me and complemented me on my reading then. We talked, and it came out that she also was feeling a touch of imposter syndrome. So we shared, reassured, and moved beyond that brief attack of imposter world. * When fences and frontiers become one and the same, that’s when we get sealed off from each other. * Walls haven’t worked in the past–why will Trump’s wall be any different? * The walls between people and nature are as toxic as the wall Trump would build. * When we think of nature as something other than us, that sets up a wall. * Natural does not mean good–natural just is. * Most things can’t be easily divided, which is why most walls break down. * It is only our silence that allows divisions to remain. One panel discussed memoir and the differences between memoir and autobiography, with some good insights there. But rather than go on longer, maybe I’ll put those observations in another post. Or not, as the case may be. One thing that I did definitely notice was the high ability level of most of the participants. Most people I talked to were writing at the intermediate or advanced level, with some sort of publishing history or professional writing background. Not saying that beginners wouldn’t benefit from this workshop, but it would definitely be of more value to someone at the intermediate or advanced levels. A fair share of attendees either had an MFA, were in the middle of getting their MFA, or were starting a program. Would I go again? Heck yes. My stated goal at the beginning of this conference was to learn ways to take my writing to the next level. I think that has succeeded–or at least, we shall see if it has. For one brief moment I toyed with the idea of getting a MFA myself…and then sanity returned. That said, I am definitely keeping an eye out for more conferences and workshops like this to attend–both in and out of genre. I learned a lot by moving outside of the speculative fiction genre gatherings, and I think there’s more to be learned. My “to-read” pile has grown by quite a bit…and I have some things to think about. Marks of a successful con, for certain. Whew. Now that I’ve somewhat recovered from the Incident, I can attempt to come up with a semi-coherent and possibly flowing description of Fishtrap so far. Well, maybe not quite that many wows. Still, I have met a couple of writers whose work I squee over, been listening to some excellent writing by both faculty and participants, and will not only leave this workshop with some good nubbins to develop into stories and essays but have gained quite a few insights into how I plan to develop Netwalking Space, the (probably) final book of the Netwalk Sequence. So. Some details. 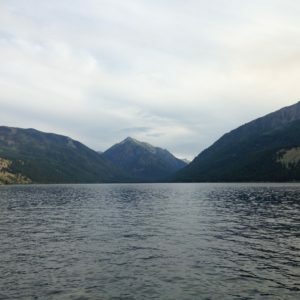 Fishtrap happens at the Methodist Camp at Wallowa Lake. Most of the activities take place either in the camp’s lovely A-frame lodge or in instructor cabins. It starts on Sunday afternoon for most participants (Saturday if you are part of the isolated Outpost workshop that’s happening out on Zumwalt Prairie; Thursday if you’re doing the short version, and then there’s a year-long workshop). The program starts on Sunday evening with instructor/class meetups and discussions, then introductory readings. Classes meet every morning from 9-12 and writing happens as part of those classes. Afternoons feature either a presentation or a panel, then open mic readings. Then in the evenings faculty present readings from their works. The faculty are an eclectic mix of poets, essayists, fiction writers, and a book artist. Based on what I’ve heard in my workshop and in the open mic, the skill level of most participants starts at the intermediate level and runs all the way up to potential instructor material themselves. The ability level of my workshop on the uncanny with Marjorie Sandor is pretty much uniformly high with regard to the use of sensory detail, sentence formation, and idea development. Not all of us write fiction; there are essayists and poets in the group as well. For the first two days, our process has included an in-class writing period and an out-of-class overnight writing assignment. We write, and then we discuss each piece. I’m impressed with how Marjorie handles this group–at thirteen participants, it’s the largest workshop of the whole week-long session. She guides and directs the critiques focused on specific and particular aspects of how the uncanny manifests in our responses to the prompts, with an eye toward getting us to think and process just how to shape those apparitions in our work. Robert Michael Pyle is giving the keynote speech on Thursday night this year, and I’m looking forward to it. I first fell in love with his work when I read Wintergreen, and I hoped to have the chance to talk to him. Well, not only did I get to talk to him, but he admired the cover of Beyond Honor (he had talked in his reading about how fortunate he was to have pretty covers, so I had to brag on my pretty covers. He did admire Pledges of Honor and Alien Savvy as well). Then, as we discussed my work, he gave me a look and commented on how prolific I was. Definitely a wow moment. Then, tonight, Erika L. Sánchez read some of her poetry. But I didn’t realize until she was introduced that she was also one of the writers I follow in the Guardian. So after the reading tonight, I had to do a little fangirl squee and tell her how much I loved her work. An unexpected coolness. But overall, the atmosphere is less likely to impose con glaze quite so quickly (though I think after tomorrow I will be dragging a little), and there’s a lot less intensity with regard to marketing. I’ve enjoyed meeting different types of writers and talking about our different works, and the focus on the writing itself is something I really needed. There’s more to write about, including some odd encounters on the drive back home tonight. However, I think I will save that for another post…it’s getting late and tomorrow will be here soon enough. The last way you want to start out a week of writing workshop is to wake up at oh-dark-thirty the morning before with a case of food poisoning. Epic though it was, however, once I had paid my respects to the white throne and went back to bed, I was okay other than feeling drug out and tired. Not sure what the cause was, or if it was even just a case of irritable bowel rebelling, but…whatever it was, I was grateful. But I’m still paranoid about food right now. Carbs are my friend, anything fatty or spicy gets eyed with suspicion, and…yeah. Bland is good. Fortunately, the Safeway in Enterprise has dairy-free yogurt, so I was also able to get things settled somewhat. The other good piece was that formalities at Fishtrap didn’t start until late afternoon so I had plenty of rest and recovery time. So about mid-afternoon, in the face of a driving rainstorm more typical of March than July, I hopped in the Subaru and drove up to the lake. Yeah. Shucky darn. My commute for the next week is gonna look like this. Fishtrap happens at the head of Wallowa Lake, in a church camp nestled between two great ridges. This time of year the mock orange is still in bloom, deer prowl the camp, and even when it’s pouring down rain it’s gorgeous. Morning workshops run from 9-12, with afternoon panels and readings, and an evening reading. This is the first conference I’ve attended where it’s about the writing–actual workshopping rather than a pitch conference or all lectures. It’s also more literary than any other conference I’ve attended before, with much less focus on marketing or self-promotion. Fishtrap’s emphasis is on Writing and the West, so much of the conference focuses on writing that evokes a strong sense of place. I’m doing a workshop on the uncanny with Marjorie Sandor, and so far I’ve found it to be productive. We did an in-class exercise this morning which led organically into a discussion of how physical setting can produce a sense of the uncanny and the meanings of various spaces. For whatever reason, it often seems that I stumble into craft stuff just when I need it. Right now I’m nibbling at the initial outline, worldbuilding, and planning for Netwalking Space. Much of what we discussed this morning will end up going into shaping what I do with the building blocks for that story. It’s amazing how that works. Tired now and realizing that I am writing jerky and nonflowing prose. Rather out of pace for a writing conference report, hmm? Oh well. Something is better than nothing.